China has launched another navigation satellite, with the BeiDou-2 ‘Compass-IGSO-4’ lofted into orbit by a Long March 3A (Chang Zheng-3A). The launch took place from the LC3 launch complex of the Xi Chang Satellite Launch Center, in Sichuan Province, with lift-off timed at 21:44 UTC – a T-0 slightly delayed due to poor weather in the region. This range of satellite was developed by the China Academy of Space Technology, based on the DFH-3 satellite platform. Equipped with a phased array antenna used for navigation signals transmission and a laser retroreflector, the satellite’s Navigation Satellite System (CNSS) is China’s second-generation satellite navigation system, capable of providing continuous, real-time passive 3D geo-spatial positioning and speed measurement. Like the American and Russian counterparts, CNSS will have to kinds of services: a civilian service, which will give an accuracy of 10 meters in the user position, 0.2 m/s on the user velocity and 50 nanoseconds in time accuracy; and the military and authorized user’s service, providing higher accuracies. The first phase of the project will involve the coverage of the Chinese territory, prior to the completed Compass constellation covering the entire globe. The constellation of BeiDou-2 satellites will consist of 35 vehicles, including 27 MEO satellites, five GSO satellites and three IGSO. 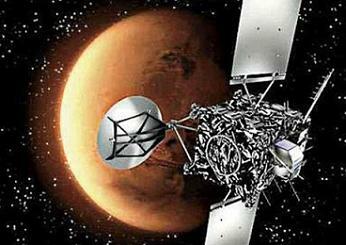 The satellites will transmit signals on the: 1195.14-1219.14MHz, 1256.52-1280.52MHz, 1559.05-1563.15MHz and 1587.69-1591.79MHz, carrier frequencies. The MEO satellites orbit on 12 hour long laps around the planet, the IGSO orbit is on an inclined geostationary orbits, while the GEO satellites are – as expected – located in the geostationary constellation. The previous BeiDou-2 Compass launch took place on April 9, when a Chang Zheng-3A orbited the ‘Compass-I3’ (37384 2011-013A) satellite. This was the 21st flight of the CZ-3A Chang Zheng-3A launch vehicle. 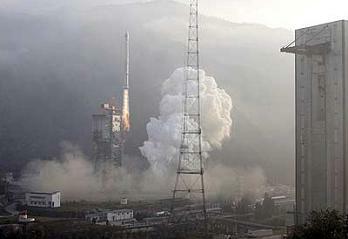 The CZ-3A is a three-stage liquid launch vehicle, which has inherited the mature technology of the CZ-3 Chang Zheng-3. An upgraded liquid hydrogen and liquid oxygen cryogenic third stage has been developed to enable CZ-3A performing greater geostationary transfer orbit (GTO) capability. The CZ-3A is equipped with a more flexible and sophisticated control system, which supports substantial attitude adjustments to orient the payloads before spacecraft separation and provides adjustable satellite spin-up rotation rate. It has paved the way for the development of CZ-3B Chang Zheng-3B and CZ-3C Chang Zheng-3C, and became the basic type of GTO a lifespan of eight years. The CZ-3A is mainly used for GTO missions; it also can be used for LEO, SSO and polar orbit missions, as well as dual-launch and multiple-launch missions. The launch capacity of the CZ-3A to GTO is 2,650 kg, the lift-off mass is 241,000 kg, the overall length is 52.5 meters, the diameter of first stage and second stage is 3.35 meters, the diameter of third stage is 3.0 meters, and the maximum fairing diameter is 3.35 meters. The first stage and second stage of CZ-3A employ storable propellants, i.e. unsymmetrical dimethy1 hydrazine (UDMH) and nitrogen tetroxide (N2O4), and the third stage uses cryogenic propellants, i.e. liquid hydrogen (LH2) and liquid oxygen (LOX). On the first stage the CZ-3A uses a DaFY6-2 engine with 2961.6 kN thrust, while the second stage is equipped with a DaFY20-1 main engine (742 kN) and four DaFY21-1 vernier engines (11.8 kN each). The third stage is equipped with two YF-75 engines (78.5 kN each). The fairing diameter of the CZ-3A is 3.35 meters and has a length of 8.89 meters. The CZ-3A consists of rocket structure, propulsion system, control system, telemetry system, tracking and safely system, coast phase propellant management and attitude control system, cryogenic propellant utilization system, separation system and auxiliary system, etc. The launch success rate of CZ-3A is 100 percent since its maiden flight on February 8, 1994, when it successfully launched two experimental satellites (the Shi Jian-4 and the Kua Fu-1, a DFH-3 model). 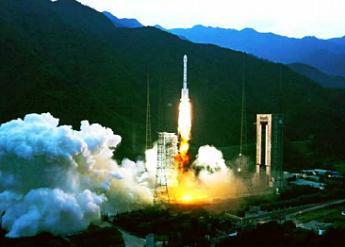 And it was awarded the “Gold Launch Vehicle” title by China Aerospace Science and Technology Corporation in June 2007. This was the 142nd successful Chinese orbital launch, the 141st launch of a Chang Zheng launch vehicle, the fourth launch from Xi Chang in 2011, and the fifth orbital launch for China in 2011. The Xi Chang Satellite Launch Centre is situated in the Sichuan Province, south-western China and is the country’s launch site of choice for geosynchronous orbital launches. Down range Tracking and Control stations of the launch center are located in Xi Chang City and Yibin City of Sichuan Province, and Guiyang City of Guizhou Province. Each of them houses tracking and measurement equipment for the powered phase of a launch vehicle flight. Before the end of the year China plans other launches like the launch of the first HY-2 Hai Yang-2 oceanographic satellite and some commercial launches. On August 14, Pakistan Independence Day, China plans to launch the PakSat-1R, a DFH-4 based communications satellite; in September also a CZ-3B/E Chang Zheng-3B/E will launch the Eutelsat-W3C communications satellite and at the end of the year it will launch the NigComSat-1R communications satellite. Other commercial launches will see the launch of the Turkish Gokturk-2 satellite and the launch of the Pakistan Remote Sensing Satellite also at the end of the year. With the shuttle now retired after the STS-135 mission, along with Russia now set to dominate the frequency of flights to the International Space Station (ISS), China is seeking to affirm its place on the world space program stage with the schedule launch of TG-1 TianGong-1 (Tiangong means ‘Heavenly Palace’) Space Station in September. Soon after, Shenzhou-8 will be launched unmanned to test the rendezvous and docking procedures on a several week long mission. 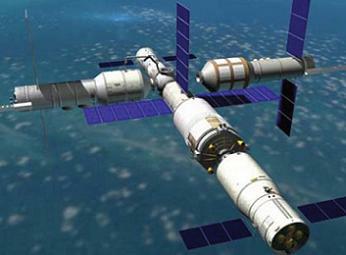 If everything goes according to plan, manned flights will follow with Shenzhou-9 and Shenzhou-10 in 2012. As previously announced, this project is the finish line of the three-step manned space program, one which involved the developing the Shenzhou spaceships, then then technologies required for docking and extra-vehicular activities – which is currently underway, prior to the construction of the space station. TianGong-1, can eventually be transformed into a manned space laboratory after experimental dockings with the Shenzhou-8, Shenzhou-9 and Shenzhou-10 spacecraft, with the last two carrying two or three astronauts each. Another major step in space and planetary exploration for the Chinese will be the launch of the YG-1 YingHuo-1 Mars probe. YG-1 will be launched in tandem with the Russian Fobus-Grunt Mars mission on November 3, via a Zenit-2SLB launch vehicle from the Baikonur Cosmodrome, Kazakhstan. Once launched, the YingHuo-1 probe will arrive at Mars, following a journey of nearly a year. The development of the Chinese probe will also build cooperation with Russia, with whom the Chinese are building ever-closer ties with. The launch was originally schedule for October 2009 but was delayed because of problems in preparing the Russian probe for launch. YingHuo-1 has a cubic structure 0.75 meters long, 0.75 meters wide and 0.60 meters high, and is equipped with two solar panels. The probe will weigh 110 kg in total at launch. This project will lift China’s overall capacity of deep space exploration and the space industry in general, transporting several instruments for the observation of the Martian surface, allowing them to analyze the magnetic levels of the planet, in an attempt to explain the absence of water on Mars. Once in the vicinity of Mars, the two probes will separate and the Chinese probe will orbit the red planet independently on the Russian probe.